Even if you live in Sydney perhaps on the outskirts, a visit to any of these Inner City suburbs is an exciting delight and can provide a welcome change of scenery exploring many of the world famous landmarks! However a weekend away in Sydney is not complete if you can’t take your furry friend! Luckily Sydney is becoming more dog friendly and you have plenty of accommodations available for you and your pup in this beautiful coastal city. 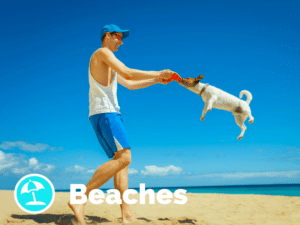 We have listed the best dog friendly accommodations for you with activities and dog friendly places within walking distance. 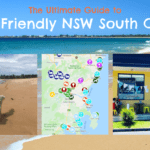 You can find the full list of dog friendly accommodations in Sydney here! 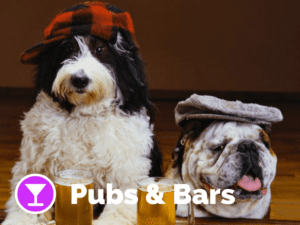 Central Sydney is host for some of the most amazing dog friendly hotels in Australia. 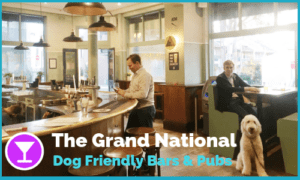 We can guarantee both you and your pup will have a truly amazing experience at these fantastic, centrally located dog friendly hotels. Stroll through the Rocks district, hang around at Circular Quay or maybe go for a walk at the Domain while enjoying the sweet harbour breeze. 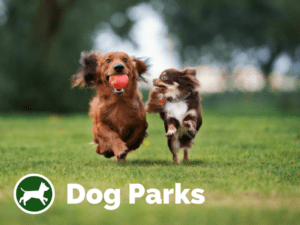 Although you are in the centre of the city, you can still find great off lead dog parks to walk and play with your pup. As a matter of fact, only Lane Cove and North Sydney councils provide more off lead dog parks than City of Sydney. 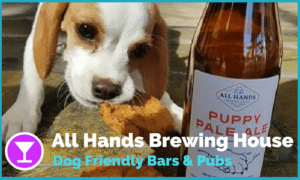 Or how about treating your dog with a Puppy Pale Ale at the All Hands Brewing House at Kings Wharf? The Langham Sydney is proud to be the only dog-friendly accommodation amongst Sydney’s luxury hotels, offering your dog the renowned 5-star service, just as you’d expect for yourself. Dog sitting and dog walking services are available on request. 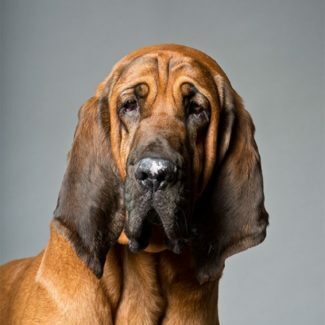 Dogs of all sizes are welcome to stay at The Langham with the additional pet fee of $120 per night! 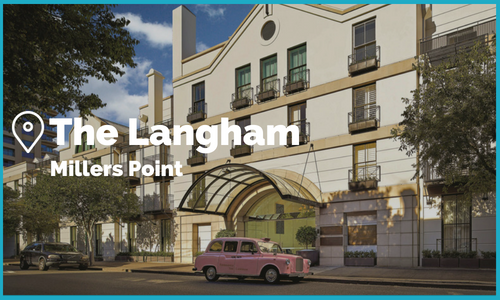 Find out more about Langham and book a luxury weekend with your pooch now! Pier One offers a stunning dog friendly accommodation in the heart of Sydney’s famous Rocks district. No need to bring any of your dogs accessories, they have it all covered from bedding to water and food bowls and even mini bar filled with doggie treats! Small and medium size dogs (max 20kg) are welcome with an additional $90 pet fee per stay! 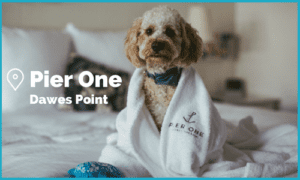 Find out more about Pier One and book a luxury weekend with your pooch now! 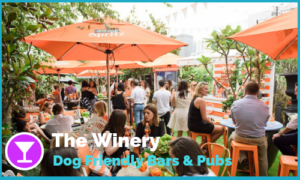 The vibrant suburb of Surry Hills is full of bars, cafes and restaurants and many of them are very happy to see your furry friend joining you for a drink or meal. 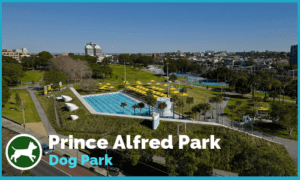 There are plenty of small off lead dog parks in the neighbourhood for you to choose from with Prince Alfred Park being the largest and most popular one. 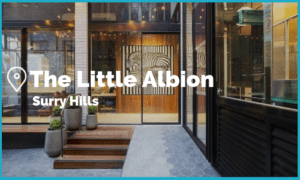 Little Albion is a superb boutique hotel in the heart of Surry Hills. There are several dog off lead areas right next door and plenty of dog friendly bars and pubs close by. 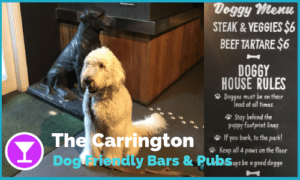 The Carrington can even organise your pups birthday party in the private indoor setting if that’s your pup’s cup of chicken broth! Little Albion Guest House boasts a north-facing rooftop garden/terrace, sunken lounge, 2 unique event spaces and both a 24-hour honour bar and host service. Pooches of all sizes are welcome with an additional $50 pet fee per dog! Find out more about The Little Albion and book a vibrant city weekend with your pooch now! 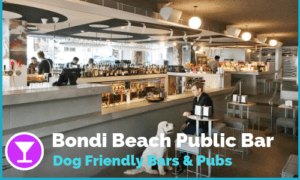 Both iconic Bondi Beach and stunning harbour side areas in Rose Bay offer some great outing opportunities for you and your pup. 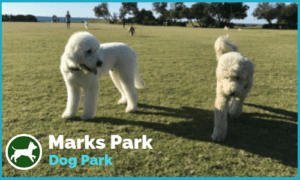 Climb up to Marks Park in the morning for an off lead play with your dog and continue to Bronte on the coastal walk for breakfast at one of the many cafés which are all dog friendly outside. 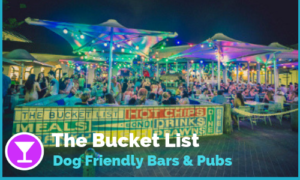 Head back to Bondi and visit the Bondi Markets or maybe have a drink at Bucket List or Bondi Beach Public Bar. There is an array of dog friendly accommodations to choose from and we have handpicked a couple of absolutely stunning homes to stay with your dog. 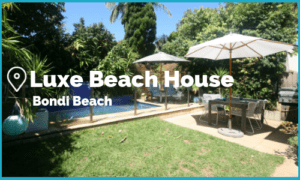 Luxe Beach House is a stunning retreat for couples and their dogs! Home away from home with all features and appliances you and your dog might need for your weekend away! Bondi Beach is only 5-10 minutes flat walk away and plenty of hip cafes and bars are only a short stroll away. However far enough in case you are after a relaxing and quiet time by the private pool. Pooches of all sizes are welcome without extra cost! 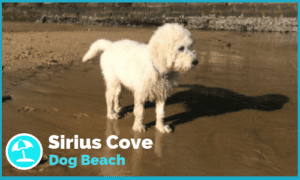 Find out more about the Luxe Beach House and book a luxury weekend with your pooch now! 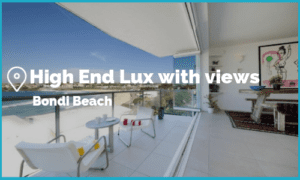 High end Lux with views delivers exactly what is says on the tin! Stunning views over the iconic Bondi Beach. Apartment has a stylish decor and kitchen is equipped with European high quality appliances. 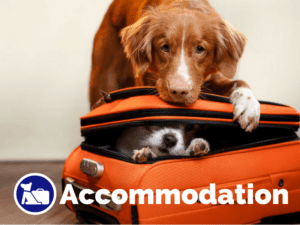 There is no additional dog fee, however guests are requested to check their dog’s (size and number of dogs) suitability upfront with the host! Find out more about the High End Lux and book a luxury weekend with your pooch now! Growing in size and popularity, the Inner West dog population is also increasing rapidly. There are more than 30,000 registered pups in the area and it is very pleasing to see the area is welcoming this with open arms. There are more than 40 designated off lead dog parks, lots of cafes and pubs that demand you to visit them with your doggo! And we should not forget to mention that the Inner West has become the Craft Beer Brewing central of NSW. 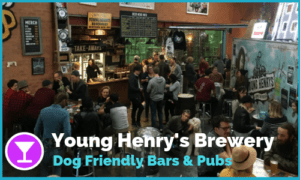 There are plenty of different breweries to choose with all of them having one thing in common, PUPS ARE WELCOME!!! After some sniffing and digging we managed to get a sense of some great looking dog friendly holiday homes for you to choose from. 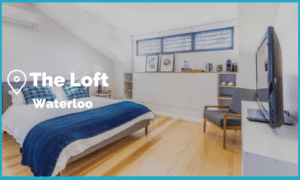 The Loft at Waterloo is a very private 1 bedroom residence for you and your dog. It’s located in a rare free standing building in Waterloo and offers you all the necessities you need including towels, unlimited Wi-Fi and even espresso pods for the early morning fix. Dog off lead park, Waterloo Park, is only few small pawsteps away! Dogs can stay without additional fees, however guests are required to pre-approve their pets with host at the time of booking! Find out more about The Loft and book a city weekend in Inner West for you and your pooch now! 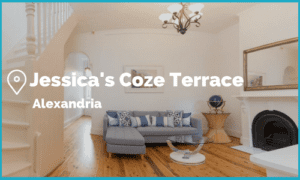 Jessica’s Coze Terrace is conveniently located in the heart of Alexandria. This beautifully decorated apartment allows you and your dog to have a relaxing weekend in one of the fast growing modern Sydney suburbs. Guests are requested to confirm the suitability of their dogs and any associated fees with the host at the time of booking! Find out more about Jessica’s Coze Terrace and book a city weekend in Inner West for you and your pooch now! Have you ever visited Newtown and thought, hmmm would be nice if it was a bit closer? If so, have you ever thought of turning it the other way around? 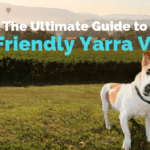 One of the most vibrant suburbs in Sydney has plenty of accommodation on offer and some of them are luckily dog friendly. Stylish Villa Rochford might be the answer for you and your dog! 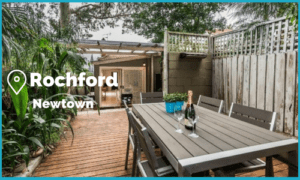 Find out more about the Rochford and book a city weekend in Inner West for you and your pooch now! North Sydney is one of the most dog friendly councils in Sydney. 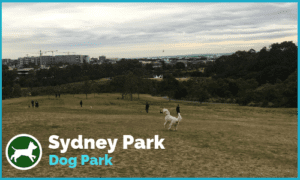 They offer more dog parks per dog than any other council in Sydney. They also have a great track record of having one of the lowest number of dog attacks in NSW. 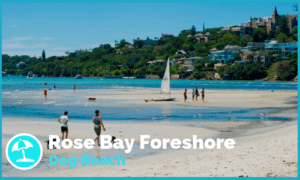 Walk along the harbour from Lavender Bay to Bluesy Point or all the way to Waverton Park and breath in the salty ocean breeze, while your dog can enjoy the various off lead dog parks along the way. Moving further east towards Mosman and Balmoral you can find some well-hidden doggie secrets. Sirius Cove and Clifton Gardens are great off lead areas with swimming access and stunning million dollar views of the harbour. 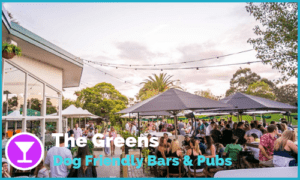 The Greens bowling club is a great family hangout in the dog off lead area at St Leonards Park. Dog friendly accommodations are a little harder to find on the North Shore but there are a few pawsome places out there. Alegria is located in the prestige suburb of Mosman. Beautiful and stylish interior design of this weatherboard Victorian House makes you want to just lift your legs up and chill out! And there is nothing wrong with that. You pup is probably very keen to join. This dog friendly home provides you with all the luxury you are looking for. Find out more about the Alegria and book a luxury weekend with your pooch now! 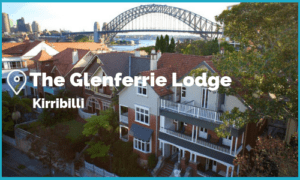 Glenferrie Lodge is an all time favourite amongst dog owners! 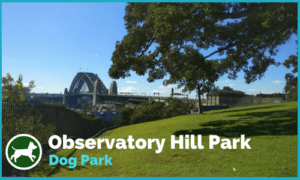 Great location in Kirribilli is only moments away from sights and dog parks. 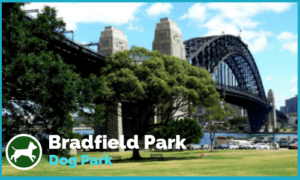 Bradfield Park (under the Harbour Bridge) is one of the most unique dog off lead parks in Sydney. The Lodge also has a fenced yard for your pup to stretch legs and sniff around. Dogs of all size are welcome with an additional $30 fee per night! 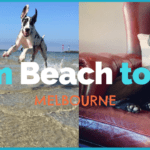 Find out more about The Glenferrie Lodge and book a city weekend with your pooch now! Centennial Park has the largest dog off lead area in Sydney. Most of this central park is off lead and cafes within are very dog friendly. 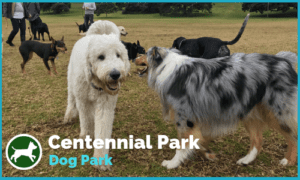 Millions of people visit Centennial Park every year but did you know you can actually stay there over night with your dog? We don’t mean camp in the park but stay in style @ The Residences Centennial Park. The central suburb of Paddington is right next door to Centennial Park. 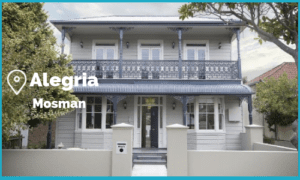 This energetic suburb provides everything from great shops on Oxford Street to restaurants and cafes to pubs and bars. 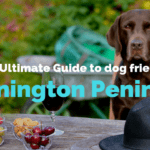 Luckily for us dog owners, many of these places welcome your dog with open arms, which makes Paddington one of our favourite spots. 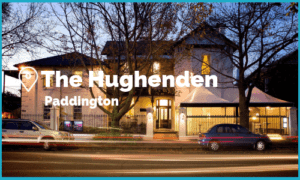 The Hughenden in Woollahra next to Paddington is not just an ordinary dog friendly hotel. 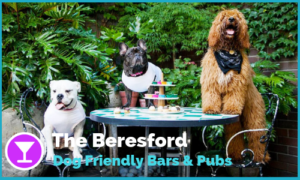 You can even book High Tea for your dog at their restaurant! 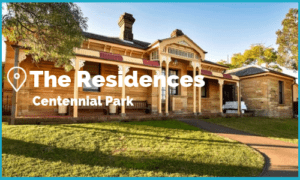 The Residences @ Centennial Park is a unique way for you and your dog to experience the Centennial Parklands. 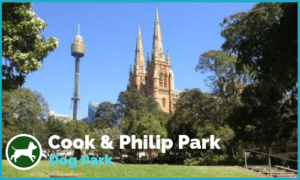 The original residences of the park superintendents and rangers are located inside one of the most amazing dog friendly parks in Sydney. Most of the area is off lead and cafes inside the park welcome your pooch to have a coffee / brekkie with you! Find out more about The Residences and book a city weekend with your pooch now! 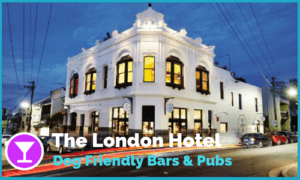 The Hughenden is one of the most dog friendly hotels in Sydney! They don’t just provide accommodation for your dog but also different pampering services such as “Doggie High Tea” are available. 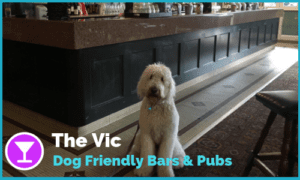 Located in the vibrant surroundings in Paddington, why don’t you take you dog for a walk to one of the many traditional dog friendly pubs in the area. Find out more about The Hughenden and book a city weekend with your pooch now!